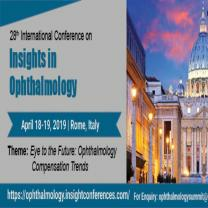 On behalf of Scientific Committee we cordially invite you to participate at the 28th International Conference on Insights in Ophthalmology to be held during April 18-19, 2019 at Rome, Italy. The theme of the conference is “Eye to the Future: Ophthalmology Compensation Trends”. which aims in exploring and address all sub-specialties and related interest associated with Ophthalmology. 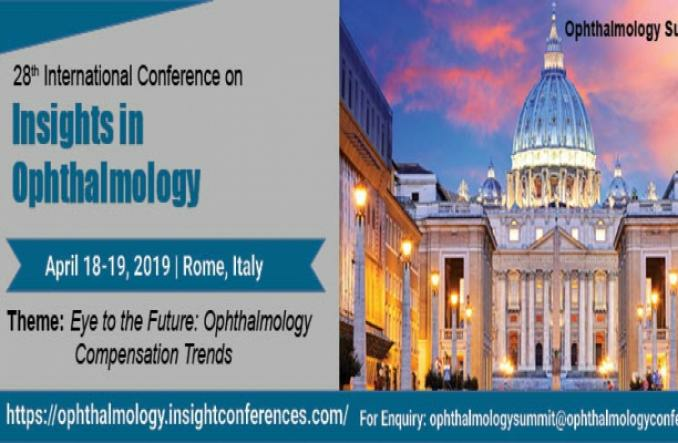 The Ophthalmology Summit 2019 brings together a unique and international mix of large and medium pharmaceutical, leading universities, research institutions, biotech and diagnostic companies making the conference a perfect platform to share experience, foster collaborations across industry and academia, and evaluate emerging technologies across the globe. Ophthalmology Summit 2019 maximizes the opportunity to interact with and learn from your peers from across the country and across the globe it held with the discussions on Ophthalmology Surgery, Glaucoma: A Vision Loss, Neuro-ophthalmology, Pediatric Ophthalmology, New Surgical Treatments For Glaucoma, Ophthalmic Optics / Optometry, Neurotrophic Keratopathy, Thyroid Eye Disease (TED or Graves Eye Disease), Ophthalmic Drug Delivery, Ocular Diagnosis and Ophthalmic Imaging, Orbital Exenteration Surgery, Ophthalmology Practice, Retina and Retinal Diseases, Cornea Disorders And Treatment, Removal of an Eye, Artificial Eyes, and Socket Care, Refractive Errors in Children and many more. Hope to see you in IIO 2019! 28th International Conference on Insights in Ophthalmology added 1 new photos. John Hyde created a Event listing.